Team_Awesome had the most liked content! Westfield IVA Steering Wheel for sale. Passed mine a few weeks ago so I've now replaced this wheel. It comes with the wheel, cover and Westfield boss. It will also come with an adapter to attach to a Mazda MX5 standard boss, as that's what I had to use. £65 including postage. I had some dry road on the way home. It's fast. I'm not sure how you cope with that large chunk extra you have. I've finally had all the paperwork through, the original documents and then the new V5 after applying my retained number plate from the Mazda. Insurance is all updated so I believe I'm 100% legal. In the end I had to wait a while as they would only apply the new plate from 1st April, even though I had the V5 earlier. It's been 4 weeks since the IVA and I've not driven it since because, if I'm totally honest, it's horrible to drive. The map on the ECU allows me to drive, but just barely. It's booked in to be tuned tomorrow so I get to drive it there and hopefully it'll be nicer of the way back. In the meantime I've been changing the rear brakes from the standard Mazda items to wilwoods These are most likely a bit overkill but I had them from the donor car so I may as well try them out. I didn't fit them for the IVA because I'm not sure the handbrake is good enough to pass it. I'll try to remember to get photos and videos from the dyno tomorrow, hopefully with some respectable figures to go with it. Exactly 2 weeks from sending the paperwork to receiving the the V5. Not bad! I've had some good news over the weekend, the car has been given a registration number and it's age related so I'm quite happy. I just need the V5 and then I can hopefully allocate the ageless plate I had on the MX5. I couldn't send the retention certificate with the paperwork as I had forgotten to change my address when I moved last year. Ah lovely. I might try that myself. You've had your paperwork back already?! This was something I wasn't expecting to do so soon but I've had to take it apart slightly. As I said in my IVA report there was a leaky differential seal so I've replaced that this afternoon. 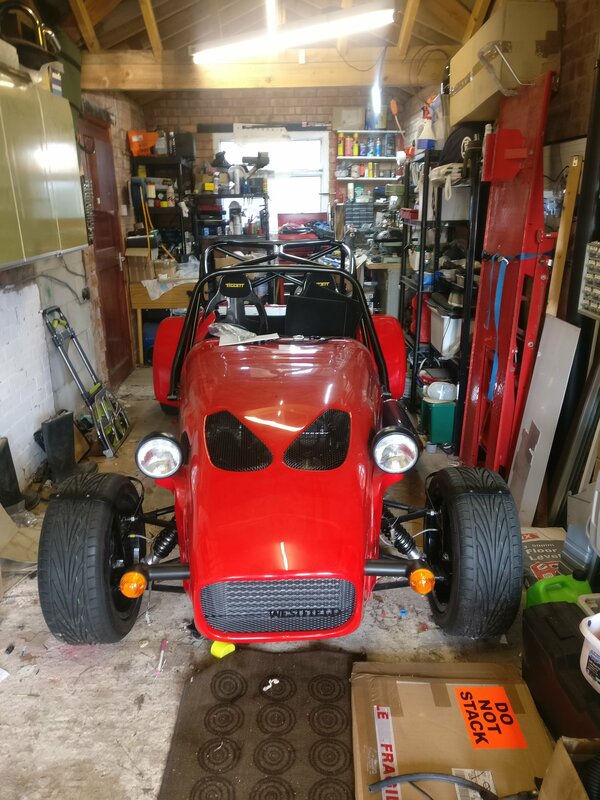 If I'm fair it's a much easier job on the Westfield than it is on the MX5 without a big subframe in the way. I've started on the post-IVA work too. First job is to replace the rear calipers for the Wilwood ones I had on the donor car. I didn't fit these as I was worried the handbrake wouldn't be good enough. Hopefully all the relevant paperwork is complete and good enough for the DVLA. It'll be sent off later today. In the meantime I've taken those awful covers off the wing mirror mounts and I'm moving on to replacing the differential seal and change the rear calipers for the Wilwood ones I had on the MX5. All I need is an adaptor to go from M10x1.0 from the Westfield lines to the 1/8NPT of the calipers and have the some parts for the handbrake cables modified slightly. I've booked the car in to be tuned at the start of April as it's simply terrible on the base map. Yeah, no point sending a car away to come back another day if the problem can be solved permanently there and then. That's good going. Hopefully mine will be sorted in similar fashion. Absolutely, firm but fair and totally reasonable. He did say "don't believe everything you hear about us IVA inspectors" and I had to explain that I'd actually only heard good things. I believe my paperwork is complete so I'll get that in the post on Monday. I'm going for a 1st April date and it's booked in for tuning on 5th April. So..... I am now the proud owner on an IVA certificate! I took the car to Leighton Buzzard yesterday full of nerves, but feeling ready for someone to validate 2 years of work. It all started very well, the car was ready and I was happy I'd completed all required tasks. Here's how it stood at 6.30am ready for the drive. At this point it had done only 0.3 (trouble free) miles. I had decided to wear my motorbike gear as it was cold but it didn't stop my hands being freezing. I could only find my summer gloves. This next photo was taken at 7.45am, just quarter of an hour before the test was due to begin. The car was hunting quite a lot and was stalling when coming to a stop. I solved the idle by whipping out the laptop and changing the tune slightly, but I couldn't solve the stalling. Luckily the examiner, Richard, had already been over to introduce himself and said that wouldn't be an issue as long as it would restart every time. Moving on to the test, it started a little late as there was a discrepancy between my paperwork and the V5. My donor car was privately imported from Japan in 1999 but manufactured in 1990. The V5 only stated 1999 so there was some phone calls to double check which emissions test that would be required. Luckily the 1990 test was decided upon. This was my first test and I scraped through. I knew it would be tight with my base map. 3.5% CO2 was the limit and I averaged 3.16%, not good but a pass is a pass. Next the car had a good looking over on the ground and it went on the ramps to check underneath. I was quizzed on a lot of the build but was able to answer all the questions easily. One of them being whether the covers for the mirrors we're provided by Westfield. I said I'd made them myself and no more was asked about them. I was asked to remove a wheel nut to check engagement and to remove one of the carbon covers at the back. All passed the test and Richard repeatedly said he'd not found a single loose nut or bolt yet and he always finds one. Good for me I suppose! Before it went on the lift it had already been mentioned that my handbrake didn't have enough reserve travel and this would be a fail if I couldn't solve it, so that had me a little bit nervous. On to the brake test Richard went through the procedure and noted the braking effort down but mentioned that he wouldn't know if it was a pass or fail until he'd put them into his spreadsheet to calculate the efficiency which he'd do at the end. My speedo test was initially a fail but I was allowed to reconfigure the dash and have it retested. 5 mins later it was a pass. The mirrors was an easy pass, I can see the whole world in that 14 inch mirror. The brakes locked up as expected and then on to my personal dread, the self centering steering. I'd been adjusting this literally minutes before the test as the journey to the test centre confirmed I had none. I wasn't able to test it out but I'd put enough toe out on the car and it did give the required effort. Richard may have hit a puddle on his drive around the test centre though. Up to this point everything apart from the handbrake was a pass but Richard had to check the brake efficiency. This gave my 15 mins to adjust the handbrake. Luckily I didn't need that long and had the tools there at the ready. Richard was happy with the travel but the brake efficiency was a fail. He said he would take the car for a drive and get them warm, then redo the test. He did this and the handbrake test at the same time. It came out as a pass! Next time I'll remember to not use track pads for a cold test! With that I had a certificate on the way and I had the world's most smug look on my face for the next few hours. All said and done Richard was extremely nice and helpful. It was clear he wasn't going to let anything slide, but he was very fair and happy to let me adjust things to make it a pass. Couldn't have asked for more, I even got a nice cup of tea from them. Finally, if anyone tells you a Mazda SDV doesn't need a shortened sump I had this when I arrived I'm working with someone to machine a new one after welding one has failed several times as the casting seems very porous. He asked whether they were from Westfield and I told him they were not. Nothing else was said about them.